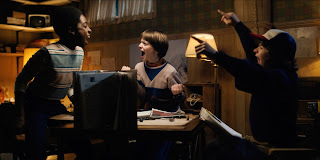 "Dungeon crawling: You have to experience it to realize it!" Dungeon brawling. That's probably the best way to describe our first play through of Dungeons & Dragons: Castle Ravenloft the Boardgame. Having played the more traditional D&D way back in my yonder years, the feels and nostalgia of the classes, spells, races and monsters were all present in this immersive co-op board game, coupled with hints of dungeon claustrophobia and sheer awesomeness. The little town of Barovia needs your help in defeating the scourge of the villainous Vampire Strahd Von Zarovich and his hordes of monsters. 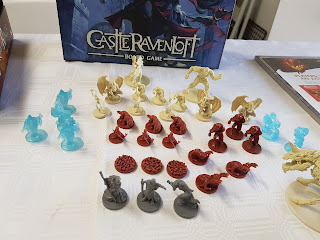 You are to descend into the depths of Strahd's castle, Ravenloft, defeat his monsters before facing up to the vampire lord himself and finally putting an end to him...once and for all. I do suggest some heavy lifting before cranking open this baby because boy is this box huge! 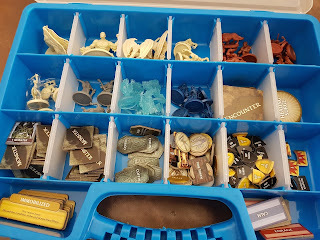 Filled to the top with components, cards, cardboard, chits, bits and lots...and I mean LOTS of miniatures which, if you're a fan like me, there are 42 of and they are beautifully sculpted pieces of hardened plastic. The minis are all unpainted so feel free to indulge your artistic selves with whatever palette your deem appropriate. 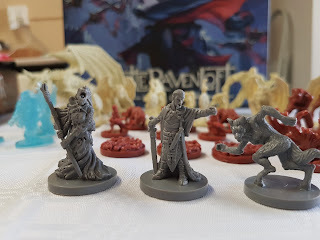 The hero minis are the typical D&D archetypes but still really cool. You have the Rogue, Wizard, Cleric, Warrior & Ranger all with the accompanying stats cards and powers/ skills. The two enclosed booklets are the rules and the scenarios and both are fairly straightforward to follow. There are 13 scenarios to play through (2 solo) with each scenario varying in length and difficulty. On average, expect a scenario to playthrough in about 40-50 minutes. 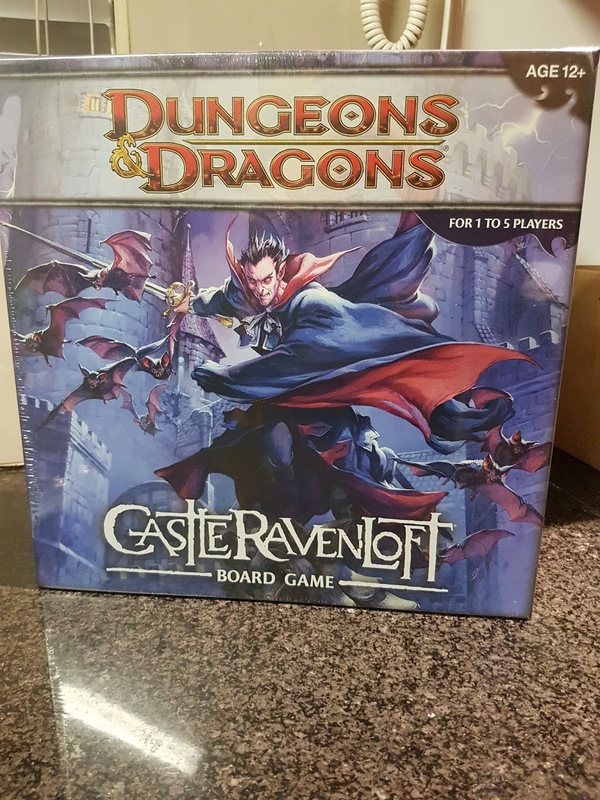 The cardboard for the dungeon tiles is thick and sturdy and even after a good number of plays, has not diminished in the least. 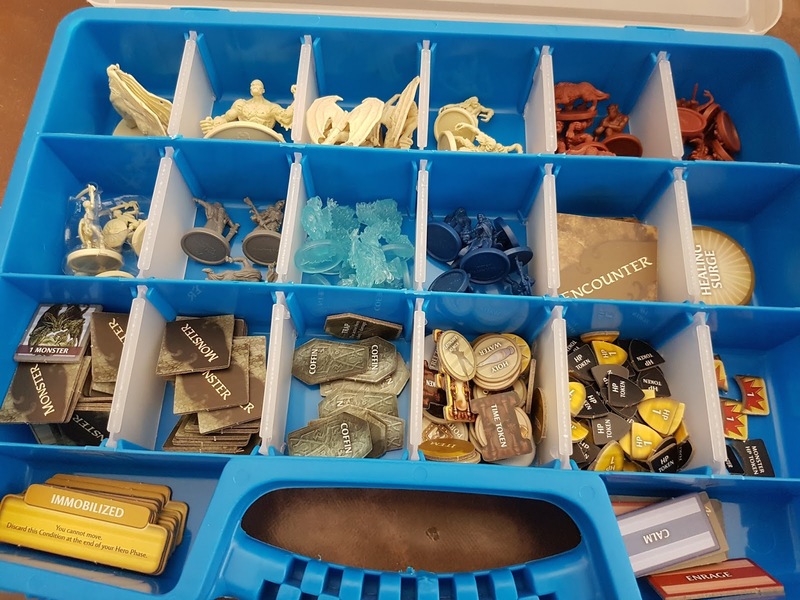 Warning: Be prepared to punch out a lot cardboard for character sheets, dungeon tiles and chits and token which are used to track hit points, movement, damage and for various items in the scenarios being covered. The 200 card deck has cards pertaining to monsters, encounters, hero powers and treasures. If anything, the only disappointing part of the components is that the cards aren't all that aesthetically pleasing as they lack artwork but still hits home in terms of gameplay. And of course there is the essential cornerstone of every D&D game: the D20 die. Get you one of these for storing all your minis! 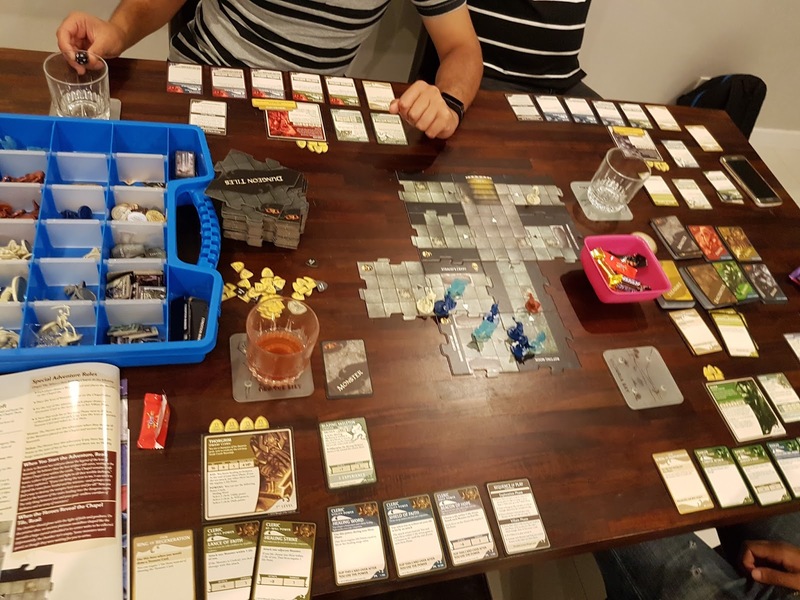 Since this game is scenario-based, you will basically be playing through each scenario and arranging the dungeon-tile stack accordingly. Essentially, each scenario has you and your band of heroes explore and uncover the dungeon in order to meet a particular objective. This can range from something small such as trying to find the 'chapel' to defeating the harrowing Gravestone, Strahd's monstrous Dracholich. The start of the game has each hero receiving their character cards and starting power/ skill cards which vary from re-usable 'at-will' powers to once per game 'daily' powers. Each scenario has its own particular setup (such as shuffling the dungeon tile stack) and it's own particular set of villains to deal with (in addition to monsters). 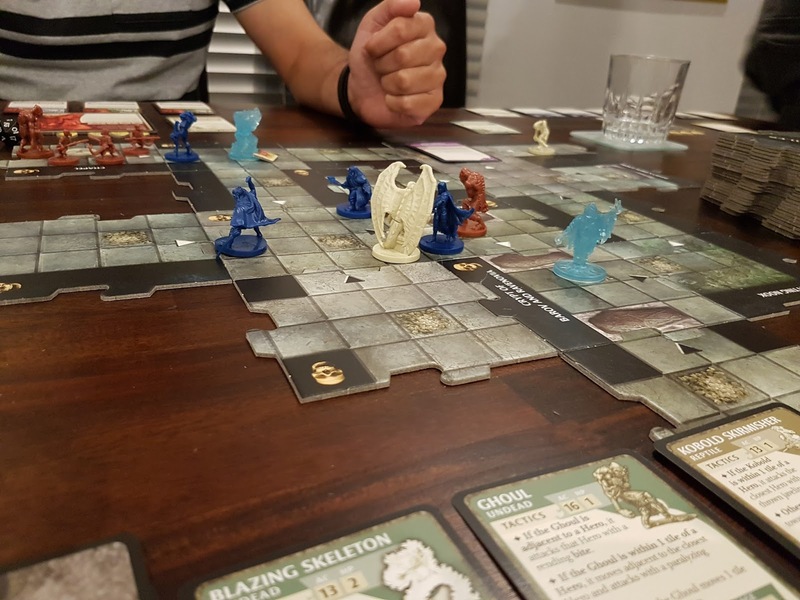 Get a bigger table - the dungeon grows! 1. The Hero Phase: Allowing your hero to move and attack/ attack and move/ make two moves. Movement is based on character's range (essentially the number of squares you may progress on any given tile) although some cards and powers to allow you to 'teleport' from one tile to another. Attacking a monster involves using one of your hero's powers to boost your die roll (D20). If your roll + boost is higher than the monster's armour class (AC), that monster is defeated and you gain a treasure card and XP. Gain enough experience points (XP) and you character can progress up a level! Gargoyles: As long as you're standing in front of 'em you're fine! 2. The Exploration Phase: Allowing your hero to draw a new dungeon tile from the stack if you're on the edge of you current tile (Think of it as you progressing down the depths of the castle, one room at a time). The explored tile is revealed and extended from your current tile and then a monster card is drawn. Now, unless the scenario rules state otherwise, monster cards are ALWAYS drawn when a new tile is added. The monster mini that is attached to that card gets placed on the new tile's bone pile. The monster is controlled by the hero who explored and drew that monster. Defeating any number of monsters during your Hero phase will gain you a treasure card which can be very useful as you progress through the game. 3. The Villain Phase: This is the phase that normally brings all the hurt. If you drew a dungeon tile with a black arrow or did not explore in your previous exploration phase, then you first get to draw an encounter card. Encounter cards generally mean bad things happen. And by bad we mean traps, obstacles or some or other form of hurt. After resolving the encounter cards effects, you activate each villain in turn (villains normally being the boss of that scenario - each with their own special set of rules attached to their respective character cards). Then you activate each monster, in the order you drew them and resolve their attacks on you and your party. 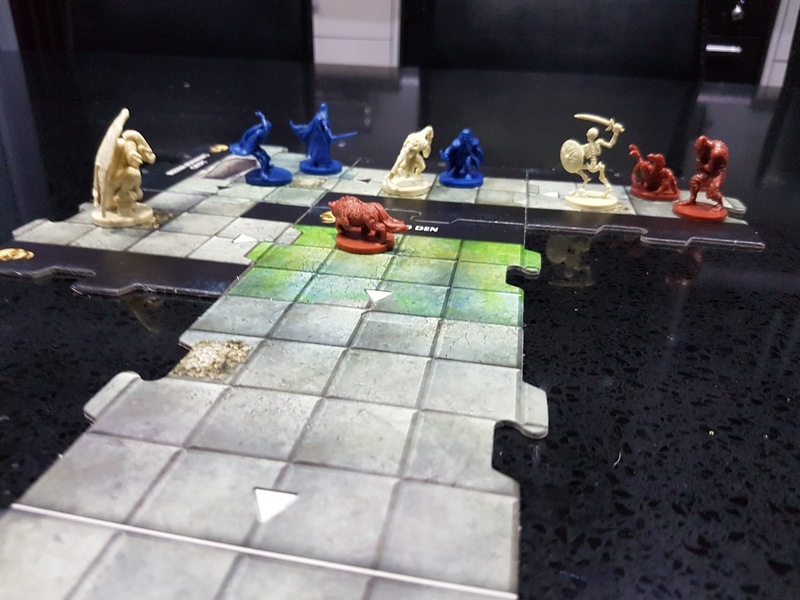 After the villain phase, it's the next hero's turn to delve into the dungeon and so the cycle continues: move, attack, explore, evade possibly and take a few punches as you dig deeper into Strahd's labyrinth.